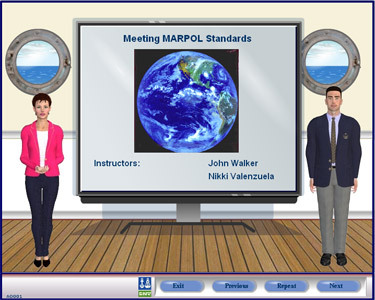 Most MMS screens link to a corresponding page in the MARPOL Regulations. When you purchase MMS you get a soft copy of the MARPOL Regulations 2011 Consolidated Edition in easily searchable form. Our computer-based training is efficient and cost effective. Mariners take training during off-duty hours aboard their vessel, not spending an extra day or two onshore attending training. When they have completed the training, passed the assessments and printed out a certificate, they can return to the program and review it whenever they want. Since we update our products when the regulations change you can be sure they are getting the most current knowledge.